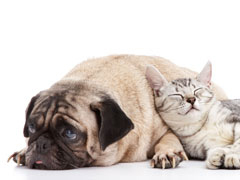 Periodontal disease is the most prevalent disease of all diseases in cats and dogs. Periodontal disease is infectious, inflammatory and typically progressive. That is why it is important to diagnose and stage this disease to decide on the best treatment options. What is the periodontium and why is it important? The periodontium consists of four tissues; the gingiva (photos), periodontal ligament, alveolar bone and the root cementum. These tissues are collectively called the periodontium. The periodontium protects the teeth. The progression of periodontal disease results in the destruction of the periodontium, and the eventual loss of teeth. furcation (where two roots diverge). without dental radiographs and probing. disease. Cat's hide their pain! Periodontal disease is the most common disease of all diseases in cats and dogs. It is an infection caused by bacteria. The bacteria are located on the teeth and the tissues surrounding the teeth (periodontium). bacteria infect the tissues adjacent to the teeth (periodontium). Periodontitis is the infection and inflammation of the periodontium. The process is referred to as periodontal disease. Notice the yellow-tan calculus (tartar). Periodontal disease is an infectious, inflammatory and progressive process. The consequence of periodontal disease can be devastating. Left first molar and fourth premolar. disease based on dental radiographs. chewing of an electrical cord. The are destroyed. and bone has been destroyed. Periodontal disease resembles a war between the bacteria and the animal's immune system. Pain and suffering is the consequence of any war including periodontal disease. The periodontal tissues are destroyed in the process, as buildings are in all wars. 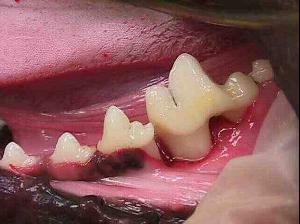 The three photos above demonstrate severe destruction of the periodontal tissues. based on dental radiographs. 2 yr dog. in 2 yr cat. Notice gum loss @ lower incisors. Severe 50% bone loss of this cat's lower jaw. Stage 4 of 4 periodontal disease. the fourth premolar middle tooth. at the same location as the above photo. Bacteria cause destruction both directly and indirectly by the release of toxins. The immune system's inflammatory response directly results in bacterial destruction, and indirectly in periodontal destruction. The gums (gingiva) become red and inflammed (gingivitis) and may bleed while chewing toys, eating or during teeth brushing. This is the official first stage of periodontal disease. The supporting bone (alveolar bone) below the gums become infected and are destroyed (stages two and three). The progression of this bone loss causes pain. Some pets are reluctant to eat. They may avoid hard food or even express facial discomfort. Teeth become loose (stage four), may abscess or fall out from loss of supporting tissues. The abscess is often below the gums, and is unable to be seen. This is why dental radiography with periodontal probings are essential for accurate diagnosis of the disease stage. Bacterial toxins, destroyed tissues and live bacteria can enter the blood stream and have even more severe consequences. Research has demonstrated further injury to major organs such as the: kidney, liver and heart. I have treated many patients that have suffered jaw fractures as a result of destroyed jaw bones from periodontal disease. The age of cats and dogs does not help with evaluating the severity or stage of periodontal disease. Stage 1; No bone loss on dental x-rays and normal periodontal probing. Without dental radiographs, periodontal probing and charting of these findings, it is impossible to diagnose, stage and optimally treat the most common disease existing in our companion animals. 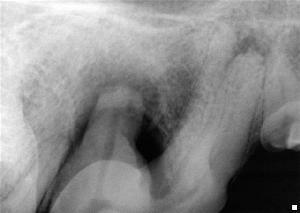 tooth with good periodontal health; attachment loss. Lower first molar stage 1.
stage 1 of 4 periogontal disease. tooth, stage 4 of 4 periodontal disease. this diagnosis would be missed. "hopeless" and a liability to this dog! Dental extraction is immediately needed. This photo is of the same dog above. space between the roots (furcation). This dog is affected with "CUPS". Dog; lower incisors have substantial bone loss. radiographs are necessary for the diagnosis. 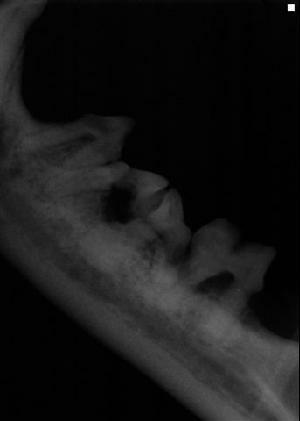 Dog; upper fourth premolar looks normal. 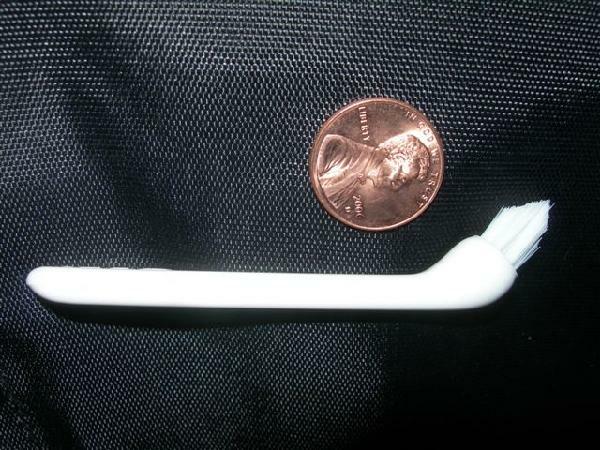 Periodontal probing revealed a 9mm pocket. of this right upper fourth premolar tooth. and periodontal probing, the diagnosis is missed. first premolar tooth (furthest left). More than 50% bone has been lost. The only way to prevent periodontal disease is to start very young before periodontal disease exists. This is a very challenging task. We see young patients daily with very early onset of juvenile periodontitis. Veterinarians encourage periodontal disease prevention by providing periodic teeth cleaning and thorough evaluations. Pet owners are encouraged to routinely brush their pet's teeth to remove plaque, and to prevent or to control periodontal disease. 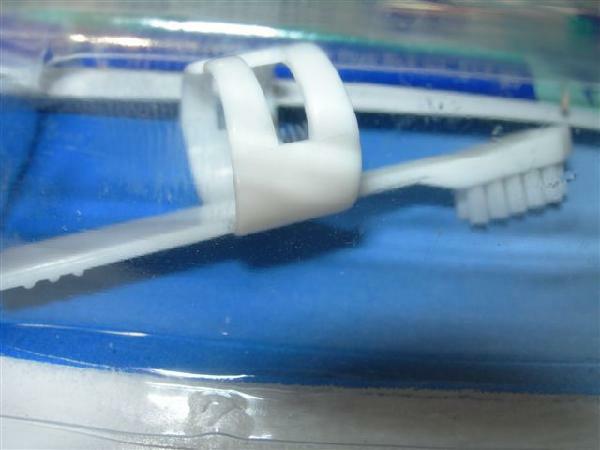 The teeth brushing technique and frequency must be adequate for prevention. We recommend daily teeth brushing. Unfortunately there is little or no benefit from teeth brushing less frequently than every other day. It is senseless to have a groomer brush your pet's teeth if you do not continue at home. Brushing pet's teeth only periodically can be painful for the pet, and dangerous for owners. Teeth brushing can be a very enjoyable experience for the pet and it's owner. If the mouth is painful and you attempt teeth brushing, your pet will associate brushing with pain and resist. Professional treatment should be administered before teeth brushing if periodontal disease is advanced. We prefer to use the term "COHAT" or comprehensive oral health assessment and treatment. This terminology is philosophically important since we are more frequently treating periodontal disease than preventing it. "COHAT" is also a useful acronym because we are focussed on the assessment of every patient we see for whatever reason they are presented. We know it is extremely important to perform periodontal probing on each patient, and to take dental radiographs. Without dental radiographs it is not possible to make an accurate diagnosis, treatment plan or effectively provide dental services. Every dental service we provide involves a systematic evaluation of the patient. Each service involves dental radiography and periodontal probing with very few exceptions! We know our patients and clients count on us to care and be very thorough. Periodontal disease treatment link for more details. Periodontal disease therapy can be very beneficial in the control of the disease, and in saving teeth. It is very important that we recognize the cause of the disease (bacterial plaque) and the need for both professional care and daily home care. Daily or even twice daily teeth brushing is the most important. Failure to comply with either professional care recommendations or home care will result in treatment failure. Periodontal disease is infectious, progressive and destructive. Ignore the teeth and they will literally go away! Periodontal disease is an infectious, inflammatory and destructive disease. Unfortunately, antibiotics alone or in combination with anti-inflammatory drugs are rarely of significant long term benefit. The diagnosis must include the stage of disease to plan the best treatment. Sometimes dental extraction is the best treatment option; however, in specific cases, periodontal surgery may be very helpful in a well planned treatment strategy. Open root planing involves surgical (flap) exposure of the periodontal pockets (from bone loss due to periodontal disease). This allows for the removal of plaque bacteria, granulation tissue and other debris. The best thing you can do is to take the time to brush your pet's teeth daily. If your veterinarian has recommended the use of Oravet, it should be applied weekly as a barrier sealent (see image below). Use your senses to identify potential problems, and if you identify problems, get help. If you smell bad breath there is a good chance professional help is needed. Bleeding, redness, oral discharge, unusual eating habits or anorexia are clear signs of a problem. It is time to get help, and dental radiographs are essential. Click this teethbrushing link for additional information. particularly useful for small dogs and cats! It is very important to evaluate the pet's teeth when they are cleaned. Cleaning must include scaling above and below the gums. Dental radiography (x-rays), periodontal probing and charting are necessary in the evaluation of your pet's teeth and oral health. Without x-rays, accurate diagnosis is not possible, and pets may be suffering without your realization of it. An appropriate diagnosis is needed to establish the optimal treatment plan. Dental x-rays are also needed to perform optimal treatment. Entire books are written on periodontal disease treatment. In human dentistry, this is an area of specialization. Please read the link below for further options for your pet. Treatment varies with the stage of periodontal disease (see above stage definitions).